A set of seven 'planetary parks' have been proposed for the conservation of the martian environment by two European scientists. 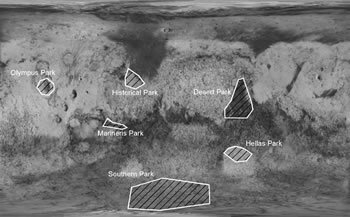 Each of the parks contain representative features of the landscape on Mars. 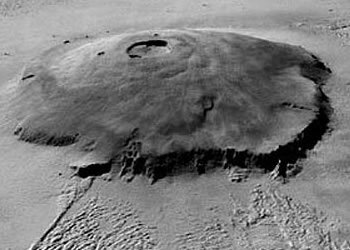 The Polar Park would protect the martian ice cap; Olympus Park would make the largest volcano in the solar system, Olympus Mons, safe from commercialism and exploitation. Charles Cockell, a Britich microbiologist, and Gerda Horneck, a German astrobiologist, point out that many parks on Earth were established to protect their natural beauty, not just wildlife. "It is the right of every person to stand and stare across the beautiful barrenness and desolation of the Martian surface without having to endure the eyesore of pieces of crashed spacecraft scattered across the landscape." Among the many barriers to this proposal is the fact that while many nations, including the United States, Russia and China, have signed the UN Outer Space Treaty, few have ratified the 1979 Moon Agreement. This agreement specifically seeks to regulate the exploration and exploitation of natural resources found on the Moon and other celestial bodies; the U.S. has not ratified this agreement. Saturn was quite a sight as it came looming up... Alas, only the two inner rings remain. Despite violent protests by ecologists and cosmologists, the Better Building Conglomerate had been permitted to harvest the third outer ring for some kind of better building aggregate. There was a housing crisis, and the [Conglomerate] paid enormous taxes. One infuriated astronomer had been euthanized for burning the chairman of the board. Also, natural and manmade caves on the Moon were used for recreation in Robert Heinlein's The Menace From Earth; loonies used Storer-Gulls Wings to flap around and enjoy themselves. You might also want to see Fastest way to Mars, Why go to Mars, and finally Better get to Mars before they terraform it. Read more at Scientists propose conservation parks on Mars.